Tilts at an angle from the top or opens like a casement sideways. The tilt position is for ventilation. Both operations take place with a single handle. When you are looking for replacement double glazing, Tilt and Turn windows are particularly useful where it is not practical to open the windows outward such as perhaps a ground floor opening onto a pavement, or onto an area where small children will be playing. 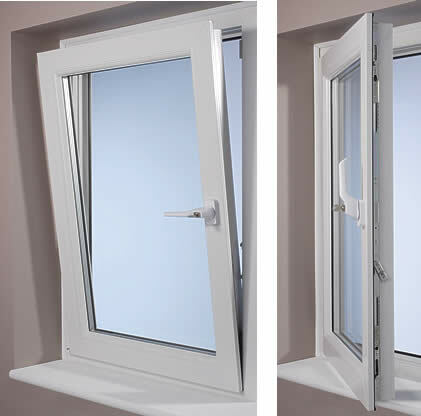 Tilt and turn windows are an inward opening window usually with a dual function handle which allows the “tilt” for secure ventilation, the “turn” for cleaning, and excellent ratings as an escape point in case of domestic emergency (e.g. fire). Not only are these double glazed windows versatile, but Stormking’s uPVC tilt and turn windows are virtually maintenance free, and with a high degree of elegance and style they will make a welcome addition to your home. If you want to allow air into your home without leaving the windows open, simply turn the handle once to open the top slightly. If you want to clean the window, simply twist the handle again and the window will swing inward on its side hinges, allowing you to reach and clean safely. Bedrooms, living rooms and areas that require sealing from dust, pollution and thermal insulation.